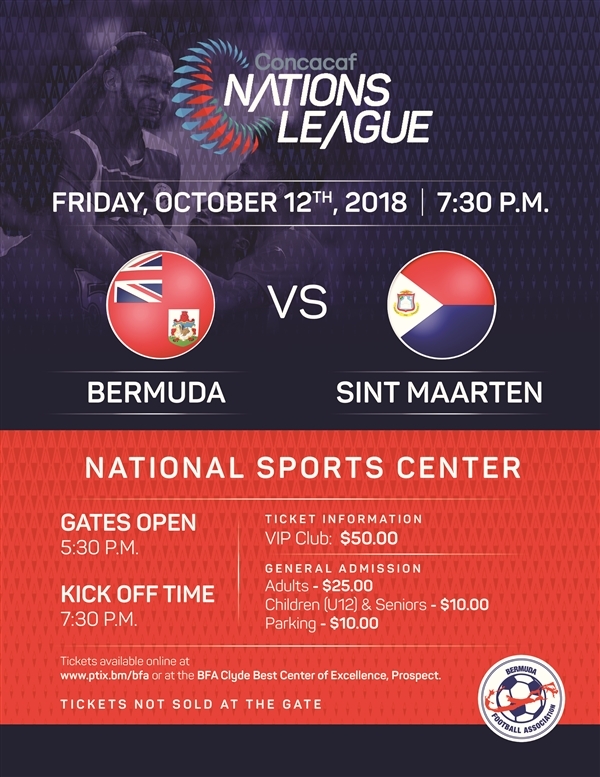 The Bermuda Football Association announced the Senior Men’s National Team that will play Sint Maarten at the National Sports Center on Friday October 12th. Gates open at 5.30pm and the match will start at 7.30pm. Tickets are $25 and can be purchased at ptix.bm or at the Clyde Best Center of Excellence. Bermuda’s team will include Jahquil Hill, Zeiko Lewis, Dante Leverock, Wendell Tre Ming, Dale Eve, Lejaun Simmons, William White, Cecoy Robinson, Jaylon Bather, Reginald Lambe, Daren Usher, Jonte Smith, Donte Brangman, Tevahn Tyrrell, Liam Evans, Roger Lee, Osagi Bascome, Casey Castle, Willie Clemons, Marco Warren, London Steede-Jackson and Calon Minors. Staff are Kyle Lightbourne – Head Coach, Ray Jones – Assistant Coach, Brendalee White – Team Manager, John Moreira – Goal Keeper Coach, Duane Dickinson – Kit Manager and Craig Brown – Apex Physio. Thats odd… No Donavan Thompson? No Nahki Wells either! Feels like he don’t care no more. Ryan Giggs mark 2! Country not good enuff 4 him! I do care! But did you ever value yourself enough to pursue your career even if it meant sacrificing your country? I left Bermuda for a reason and that was to elevate my game through opportunity to immerse myself in the most demanding league in the World and of late I have had to devote my entire time and energy to make my teams starting line up. Sometimes you have to prioritize things and do what’s best for yourself as I am sure those of you who think less of me would do the same. Good man Nahki – well done for responding. You do you.